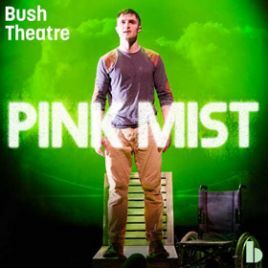 From a well-received run at the Bristol Old Vic last year, Owen Sheers’ Pink Mist arrives at the Bush Theatre in a quiet storm of heartbreaking poetry and theatrical splendour. With little to look forward to in their downbeat Bristol lives, Arthur leads his pals Taff and Hads in following the maxim “dulce et decorum est pro patria mori” and enlisting for the armed services. But much as the men who marched asleep in Wilfred Owen’s poem, this trio’s experience of warfare is a brutalising, dehumanising affair. “Who wants to play war” is the updated refrain for this generation. Fittingly, Sheers’ play – originally written for radio – is as much dramatic poem as pure drama, a deeply lyrical response to the war on terror, to all wars in fact. These characters may be fictional but they’re based on extensive research by the writer and rooted deeply in their birthplace, hyperlocal references constantly reminding of the importance of home. And it’s not just their tale, the men leave behind a girlfriend, a wife and son, a mother to fight in Afghanistan and Pink Mist gives voice to their struggle too, to demonstrate how the ripples of war casualties echo far beyond the front line. To emphasise the poetic beauty of the text, co-directors John Retallack and George Mann employ the kind of stylised movement that brings to mind Frantic Assembly, not quite dance, not quite mime, but still an expression of something profound as it elucidates and elevates. The image of a man jumping off the Clifton Bridge is echoed in a body blown from a jeep by an IED, the crush of bodies at iconic nightspot Thekla finding parallels in company under sniper fire – the use of movement is always elegant and supremely executed as the company of six who are onstage throughout. Led by Phil Dunster’s Arthur (a truly astonishing performance given he’s a recent graduates of the Bristol Old Vic Theatre School), the ensemble work is stunning and if the other characters aren’t given as much time to shine, they make that time count. The shell-shocked impact of PTSD and trauma of life-changing injuries are beautifully essayed by Peter Edwards and Alex Stedman; Rebecca Hamilton, Rebecca Killick and Zara Ramm each deeply compassionate, their primal screams warped into the cacophony of war itself in Jon Nicholls’ bravura sound design. In the sparse playing space of Emma Cains’ design, lit with bracing boldness by Peter Harrison, Pink Mist emerges as a stunning piece of theatre. Deeply respectful yet burning with rage, it forces a genuine examination of what we ask of our servicemen and woman – a culture that revels in a war going on so that “we can do what we train you for”, where friendly fire gets rebranded “blue-on-blue”, where pink mist gets its own horrific definition. As the play ends, someone laments “nothing is as it was“, I’d wager not a member of the spellbound and shaken audience would disagree.